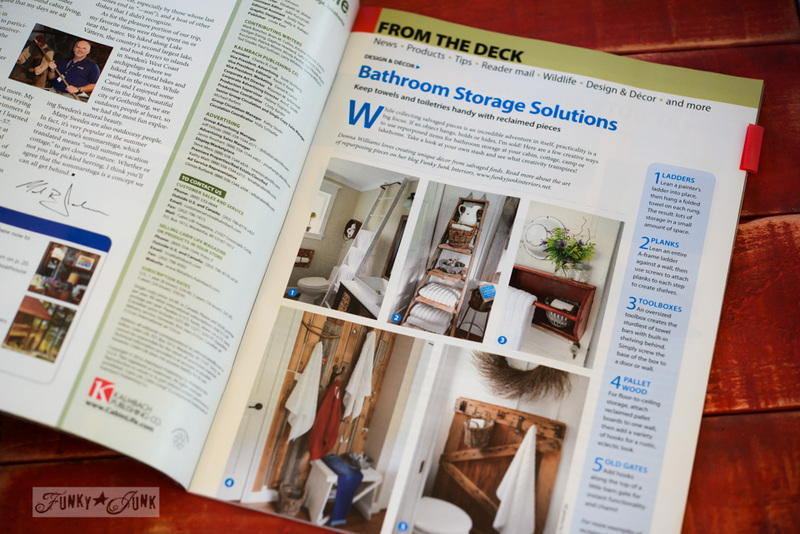 Well, lately I got to do the next best thing to my little dream… Cabin Life Magazine called on me to do a feature for bathroom storage ideas that would be suitable for a cabin. YES PLEASE! HOW! FUN! Giddy! 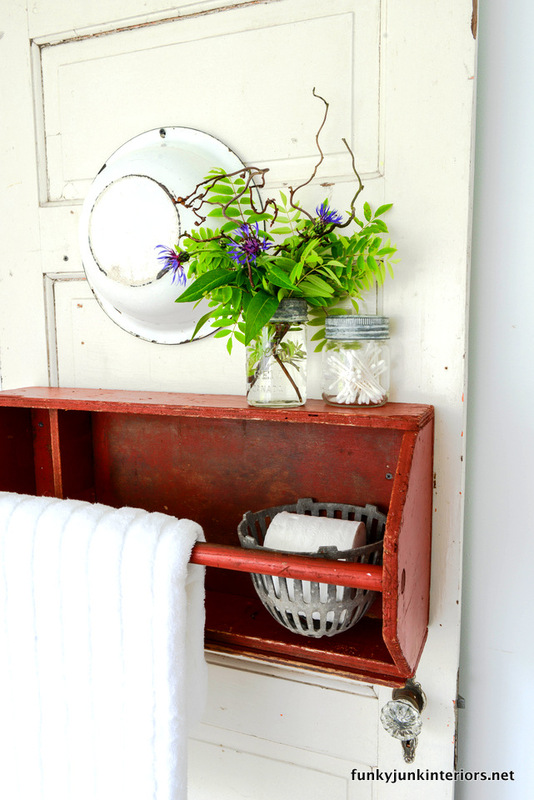 An old toolbox got turned to it’s side, mounted to an old door, and became an instant towel holder. And now I want to take it off that door and put it in my own downstairs bathroom. Maybe I’ll just leave it on the door. I really love it! It’s a good sign when you sell yourself on your own idea, don’t you think?! And then I morphed my ladder side table into a towel storage unit. Yes… I think if I had a cabin this would be perfect! You’ll recognize this bathroom… it’s the way I have it now. But I reshot the room to show the ladder as the most prominent feature. By this time, I was on a ROLL. My pallet wall in my master bathroom became a pretty funky cabin wall idea, with a sauna touch, don’t you think? They all made it into the magazine! WHOOOOP! Why yes I sure do! And it was so fun to pretend I lived in a cabin for a short while… even if it was in my own home. 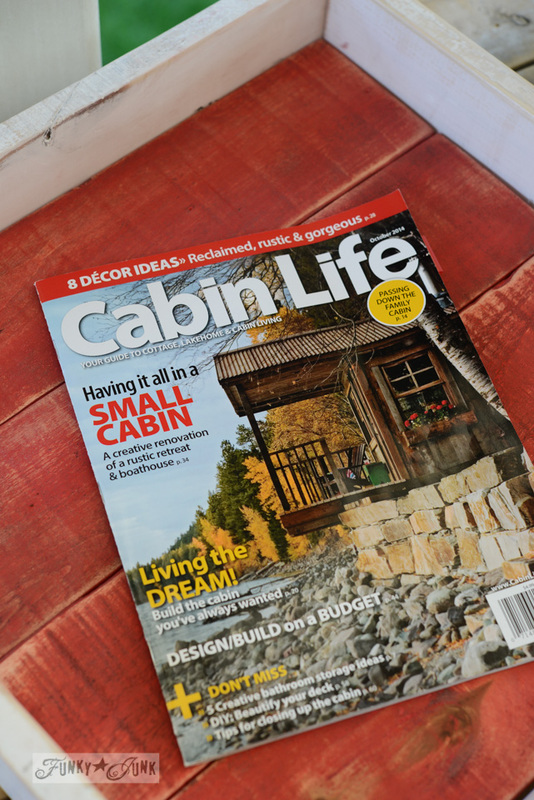 Oh Cabin Life, you make my heart pull so… because you KNOW I had to browse through more than just my own feature, right? 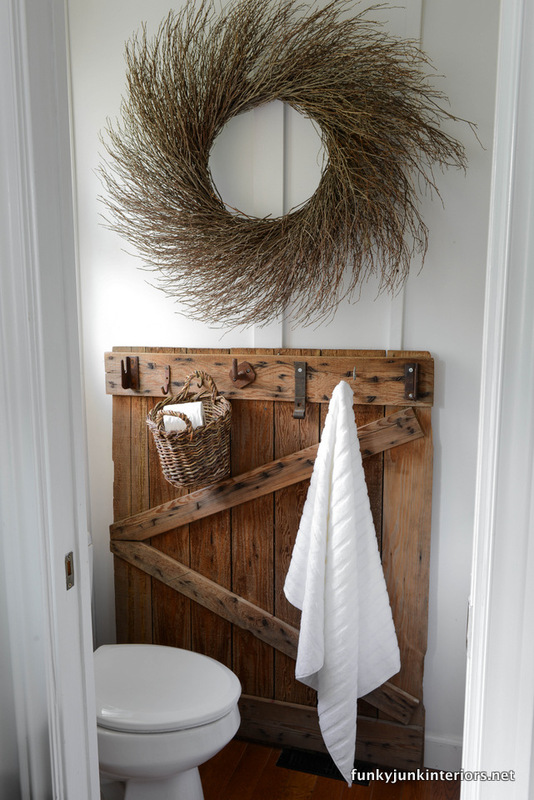 Thank-you so much, Cabin Life, for accepting my crazy ideas, loving my photos, and allowing me to be living (close to) a Cabin Life with bathroom storage ideas. Even if they were from my own home. A girl can dream, can she not? 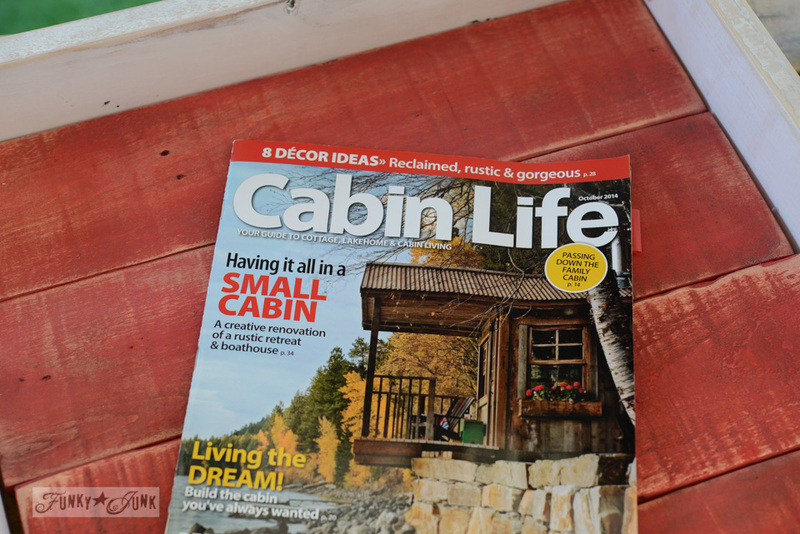 You can see my other Cabin Life feature of my stairs HERE. This is wonderful Donna. 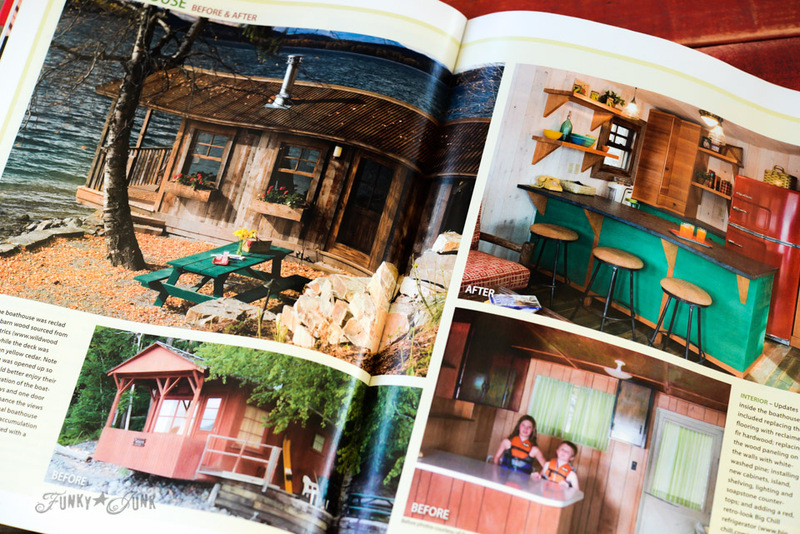 I love your rustic storage ideas, and I’m glad Cabin Life did too! This is great, I will have to keep a look out for that magazine next time I’m at the store. Love the wood – in the natural is my favorite. What great ideas! I dream of having a mountain cabin. And a beach cottage. And a lake house. I already have ideas for decorating all of them. Lol Congrats on the article! I dream of being asked to be featured somewhere someday too! You’re hard work made your dreams come true. I too dream of living in a cabin in the rocky mountains. You ideas are wonderful. It all looks so beautiful. Confucius say: When the cabin comes calling it is wise to open your door, and have plenty of towel storage. I can SO relate to your desire for a little cabin….somewhere! I always wanted a log cabin by a lake (think “On Golden Pond”)! As I have gotten older, I too have turned portions of our home into “The Cabin”! 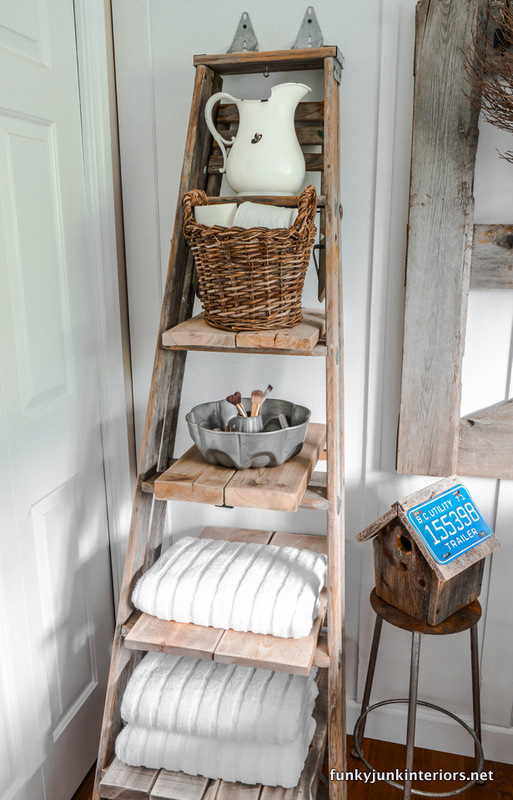 Awesome bathroom storage ideas! Congratulations on the feature! Awesome ideas and wonderful magazine spread! 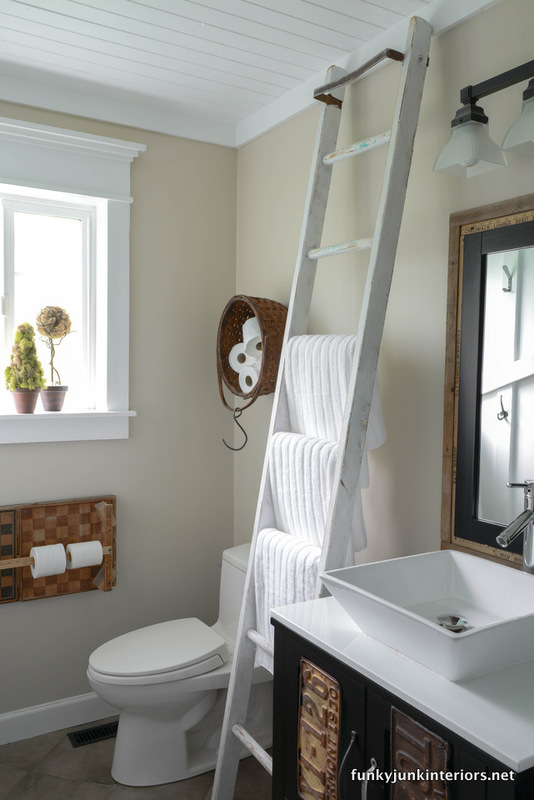 Love, Love, Love your Bathroom! Whoot! And congratulations! All ideas are of course, amazing! Heading out now to find a copy of Cabin Life. 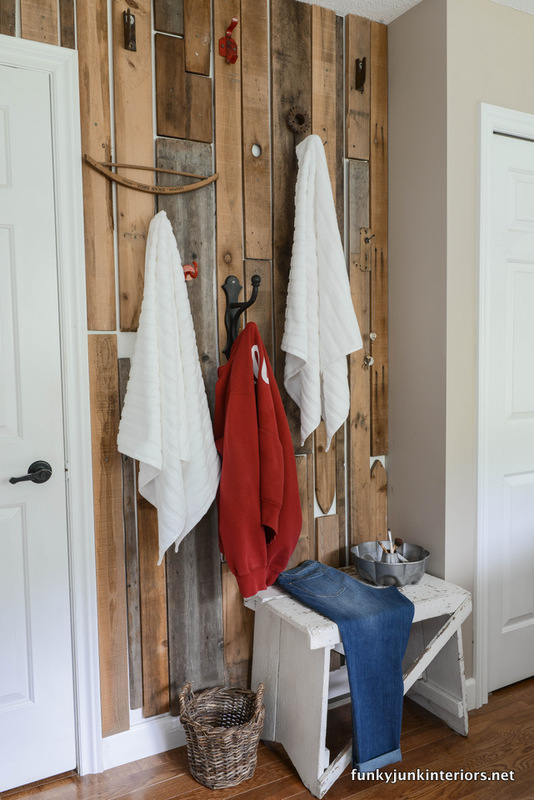 Love your idea for the toolbox as a towel holder. You did it again. When I hit the lottery, I’m buying you that cabin! How else can I repay you for all your blog means to me. 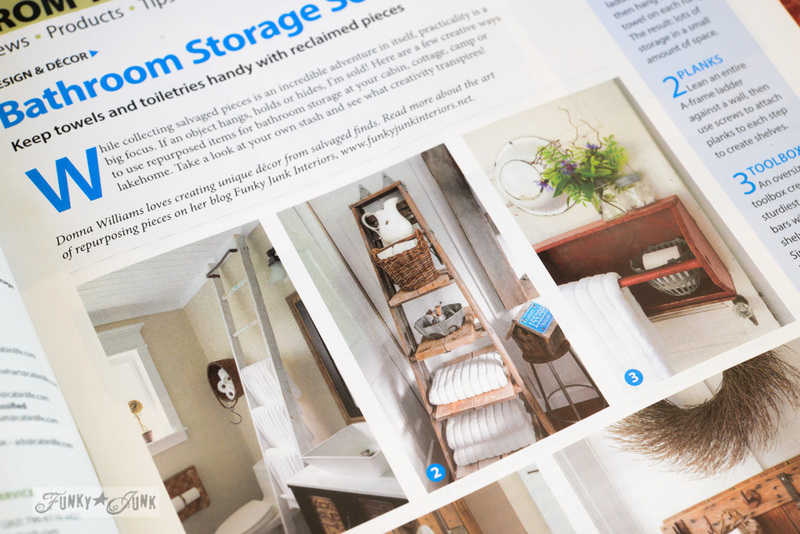 What a great feature, Donna – and your junky rustic style is a perfect fit for the magazine’s content! And just think…We knew you when… Congratulations! Everything you make and do is just so darn fun. I don’t like many decor ideas that take themselves so seriously! I love reading your blog and seeing what you come up with. Enjoy.